Marvel invests a lot of effort and money in to all-ages comics these days. I cannot remember more than one or two all ages Marvel comics a decade ago when I got into comics. In contrast, these days they have numerous titles with male and female leads. Some spin out of TV Shows, while other properties were born in the comic racks, like Moon Girl and Devil Dinosaur. Marvel Rising falls into the former category, but it suffers none for it. Marvel Rising, the TV show, follows a predominately female team of superheroes as they fight crime and solve murders. (Honestly, I checked IMDB, and Ghost Spider is framed for murder, and the rest try to bring her in.) It’s a show that has performed well for Marvel, allowing them to make popular toys, costumes, and other merchandise. It also introduces many heroes who may appear in the next phases of the MCU to a young, eager audience. While it may sound cynical to point out all of this, I say it with respect, because Disney has done a great job in the quality too. 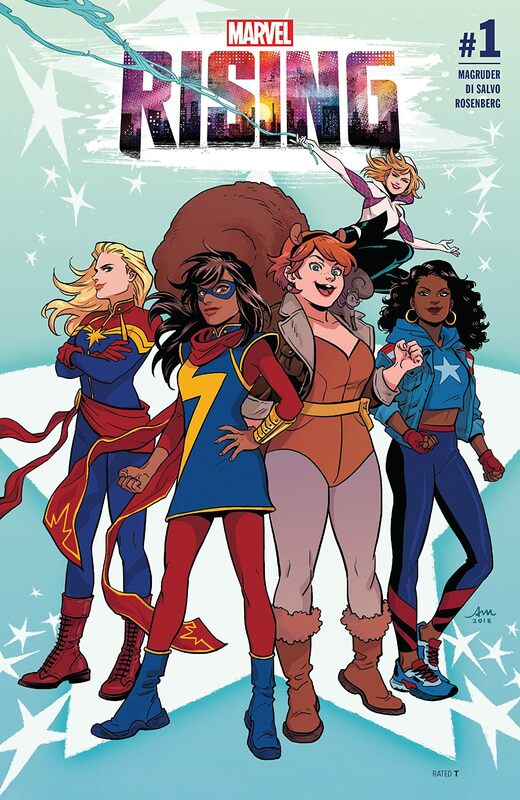 Last year saw the Marvel Rising miniseries, focusing on Ms. Marvel and Squirrel Girl. The book sold well and critics liked it. (Most importantly, by Squirrel Girl Aficionado Bob Reyer.) This year’s miniseries follows Squirrel Girl (and her partner Tippy-Toe), Ms. Marvel, Spider-Man (the younger Miles, not Peter), and Inferno. 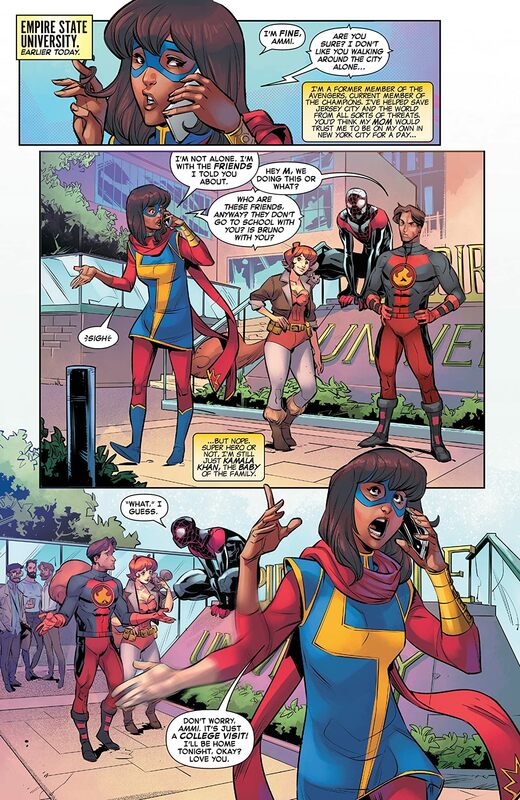 Squirrel Girl takes the heroes on a college tour of ESU at Ms. Marvel’s prompting. College quickly approaches for these teenager heroes, and as a natural leader, Ms. Marvel wants all of them to be ready. Inevitably, the tour is interrupted by cars driving erratically and jousting in the campus streets. The heroes rush to stop this, but the cars speed off, and they follow them deeper into the city. Off in the distance, a villain is summoned from Weird World, ready to take over the city. 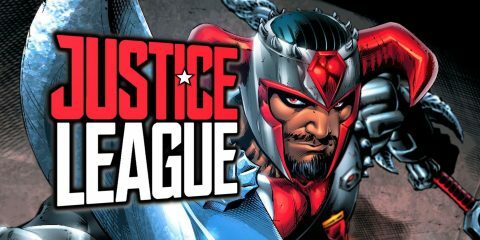 The issue predominantly consists of dialogue, but that does not take away from the enjoyment of the story. The witty banter and interpersonal relationships entertain. As a result, the characters speak the way you expect them to from their comics, and the issue made me hungry to see these characters together on the big screen. The art and colors of the book by Di Salvo and Rosenberg fit perfectly to the tone of the story; more importantly, the characters look unique to this comic, instead of like carbon copies of other series. Verdict: Buy! This comic thoroughly entertains, and readers of all-ages will be able to enjoy this fun, carefree tale.